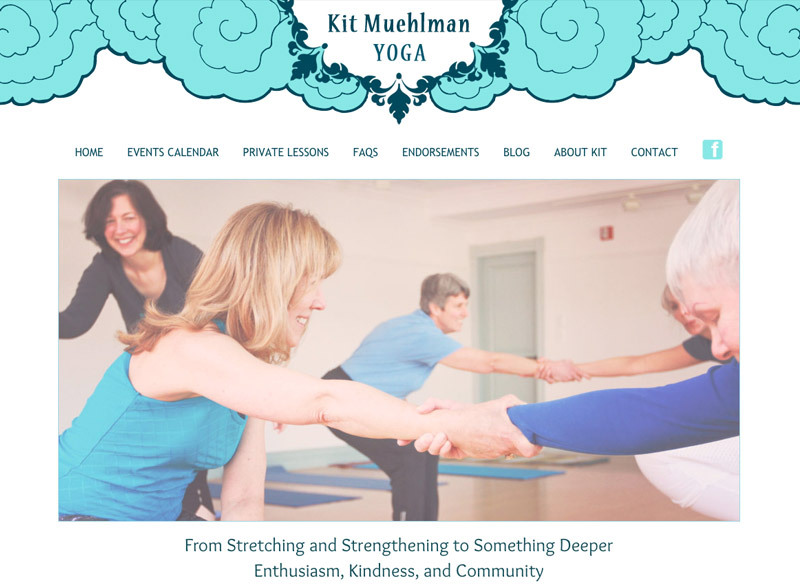 Kit wanted a yoga website to clearly convey the type of person she is and the classes she offers. For the design aspect I work closely with the client on their design preferences and translating their mission/vision into graphics/images that will appeal to their sensibilities and the audience they want to attract. This was a fun site to create as I got the chance to do some cool graphics in the header and footer sections. Kit and I chose clouds for the top and waves for the bottom. Then I sourced illustrations I thought would work and created a color pallet. We decided on turquoise and blues for the theme of the site and she scheduled a photo shoot with the students and her adhering to the color theme so the images would blend well with the website layout. Images are so important! You want them to work well with the website design and not clash or be too obtuse or overbearing. The photos from the shoot came out wonderfully and really give the viewer a glimpse into what it’s like to attend her classes. I used line drawn images in the sidebars that kept the feeling of the overall theme of the site. Kit also needed a calendar of events and we used a great plugin for the calendar that is easy for viewers to see exactly when and where her classes are offered.